It seems as if every time I mention the word Workamping to a group of people, there is always someone in the group who looks confused. There is also always someone ready to help explain to that person what exactly I’m talking about and how it’s really just for retirees. There’s usually someone who’s Workamping, but considers themselves as more of a digital nomad or remote worker. The result is always the same – we embark on a conversation how how Workamping has changed over the past 30+ years, and what was once typical has evolved and expanded to include a variety of other options. To be honest, I could just grin-and-bear this misguided conversation and allow these folks to explain some of the biggest misconceptions in the world of Workamping to each other. I could continue to enjoy my campfire with my s’more in hand and let these folks continue to think that remote or digital work, and anything other than camp hosting is outside the scope of the term’s definition. I could sit silent, but to do so would be a disservice to all the non-retirees who I’ve met, the people who run small businesses or work for amazing remote companies and those who accept Workamping jobs at a variety of businesses while enjoying the RVing lifestyle. Instead, I politely interrupt and explain that while it may seem to them that only retirees are Workamping, the fact that the tens of thousands of members who rely on Workamper News for jobs, education, information, and inspiration range from the ripe old age of 18 to well into their 80s proves otherwise. I know for a facet that families with small children are Workamping because I have been doing it with my kids for over fours years now. I know that millennial couples and singles are Workamping because I’ve met them. And I know that many folks who aren’t relying on retirement income are also Workamping because – to be honest – many of the people in the category I’ve met have been loud, proud, and quick to tell you so! It’s sad that people are quick to denounce the Workamping lifestyle and charge it off as something you can only accomplish after “putting in your 50” (as I was told by one not-so-friendly RV neighbor I had while working for Amazon’s Camperforce program in Kentucky). While this may have been the way Workamping started, as with all things in life, change is bound to happen. 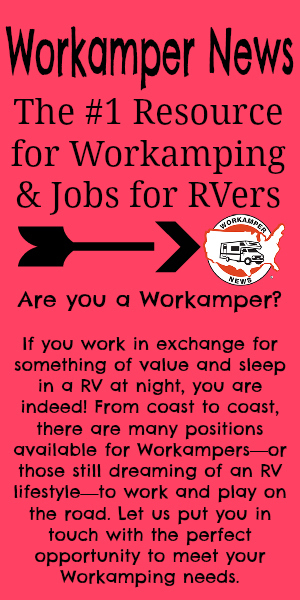 Back in 1987, Workamper News was founded by a husband-and-wife duo, Greg and Debbie Robus, who had the idea that a publication aimed at helping RVers find jobs was a great idea. Greg worked for the US Army Corps of Engineers as a Park Ranger recruiting seasonal employees to live and work at the parks. Impressed by the work ethic of the mostly retired and semi-retired applicants he worked with, it seemed they had discovered a tiny community of RVers who wanted to continue to work as they traveled. Greg and Debbie felt moved to provide a resource to help bring the jobs to the people who wanted them, and Workamper News was born. For many years, the world of Workamping would continue to grow and develop as more and more people took their retirement on the road and worked as camp hosts at various state, national, and private campgrounds across the US. So yes, to be honest, I firmly believe it all started with retirees and camp hosting positions, but as we all know…times change and Workamping is no different! Naturally, Workamping has evolved to fit the need and wants of the RV community over the past 30+ years. What was once a few cozy, retired citizens taking their funds on the road for adventures at the best parks throughout the land, has now turned into one of the fastest growing alternative lifestyles that the US has seen in decades. Workamping now includes a growing population of younger campers from age 18-45 who have no desire of a traditional life of 9-5 jobs, years work on the weekends, or quietly reading about amazing places in great books by the fireplace. They’ve shifted their focus in life from working to pay for possessions to working to pay for experiences, and travel offers them a wide variety to choose from. These folks want to see and do as they please, blow into a new destination, conquer all it has to offer, then blow out again like a summer breeze. Stay tuned next week to learn just how Workamping has changed over the years.